This blog post originally appeared on Concurrent Media. The rise of subscription streaming services, in both the music and video industries, has given the lie to the old complaint that consumers won’t pay for content online. But to many in the music industry, to say nothing of streaming investors, too many of them still don’t. Ad-supported free streaming services remain the bête noire of the record labels and music publishers. They rail against YouTube, even as they’re making deals with it, and have fought to restrict the copyright safe harbors that allow YouTube to profit from music posted without license by users. They’ve maintained pressure on Spotify to shift more of its free users to its paid subscription tier, a tune now echoed by potential investors as Spotify eyes an IPO or public listing of its shares, and have begun to restrict when new releases are made available on the service’s free tier. Pandora, the largest free streaming platform after YouTube, felt compelled to roll out a new subscription tier as it tries to woo investors and potential suitors. To hear many in the music business tell it, the industry would be better off if free streaming went away altogether. The video streaming business, however, has lately been moving in the opposite direction, at least on certain fronts. While over-the-top subscription streaming services continue to proliferate, streaming platforms continue to invest in free, ad-supported content. Ad-supported streaming service Tubi TV this week announced a new, $20 million funding round led by Jump Capital, bringing its total funding since in launched in 2014 to $34 million. While Tubi is targeting the same cord-cutting consumers being catered to by the likes of Hulu, Netflix, CBS All Access and HBO Now, founder and CEO Farhad Massoudi thinks there’s a limit to the amount of paid content consumers will support. Tubi counts Lionsgate, MGM, Paramount and Starz among its 200 content providers, according to the Journal, and boasts a library of 50,000 movie and TV titles — an indication that TV rights owners are still open to distributing content via free platforms. Little, if any of the content on Tubi TV is in its first release window, of course, and in many cases has been thoroughly monetized already. So the circumstances are not entirely comparable to the music business. But free, ad-supported video streaming is nonetheless attracting a growing amount of direct and indirect investment in new production. Facebook, which has made ad-supported video streaming central to its growth strategy, is preparing to debut a slate of original series in June, ranging from mobile-friendly 5-10 minute fare up to more traditional, 30-minute episodes suitable for watching on TV. Secondly, when I started to look at the statistics, they showed a share shift from advertising-supported shows to ad-free shows, which started to increase. I just think that’s a trend that’s not favorable to our biggest partners. We are the biggest video platform in the world. We should play a role in changing that. Even traditional media companies are eyeing investment in original, ad-supported streaming content, as the list of TV networks and studios lining up to create TV-like content for Snapchat attests. The reasons for the differences in attitudes toward free, ad-supported channels are both historical and structural. Historically, the music industry’s primary ad-supported business — terrestrial broadcasting — was conducted under compulsory license by broadcasters. Rights owners earned only royalties based on use, under a formula set by the government, or, in the case of sound recording owners, nothing at all. In contrast, advertising was for many decades the exclusive means of monetization for TV content and the industry’s corporate structure was built around that paradigm. Critically, TV rights owners controlled and conducted the majority of the advertising sales, claiming 100 percent of the revenue it generated. 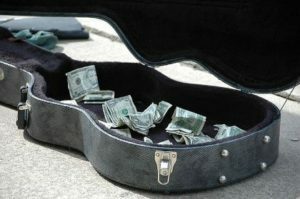 In the streaming era, music rights owners have been able to tie their earnings more directly to the total advertising revenue pie, but they still don’t control ad loads or prices, and their slice of the pie is still calculated in part by the government. Video rights owners, in contrast, have been able to carry over their direct control of ad sales into the streaming era. So, could the music business ever accommodate itself to ad-supported business models as the video industry has done? Not without major copyright and structural reforms. But the video industry’s experience suggests that paid and free channels are not inherently incompatible.